Inactive control for GSK-J1 (ab144396, IC50 > 100 µM for inhibition of JMJD3) in vitro. 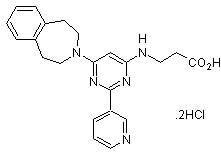 Pyridine isoform of GSK-J1. Publishing research using ab144398? Please let us know so that we can cite the reference in this datasheet. There are currently no Customer reviews or Questions for ab144398.